FALLUJAH, Iraq -- The standard fighting load for Marines in Iraq is anything but "standard." Sure, there are the "must-have" items - weapon, first aid kit, helmet and flak jacket - but when it comes to the "nice-to-haves" it's every Marine for himself. "We're leaving on a patrol in five minutes! Get your gear together!" said Staff Sgt. 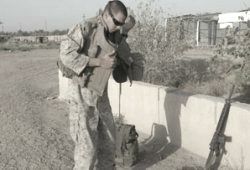 Christian B. Amason, a platoon sergeant for Company G, 2nd Battalion, 2nd Marine Regiment, assigned to the 1st Marine Division. That used to be a cut and dry order, but with today's gear, combat loads are tailor fitted. Even packs come with detachable pouches, adding and taking away space for gear. It's a balancing act. Too much gear, it weighs the Marine down. Too little, and they suffer needlessly. Take Amason, for example. He's a former Army Special Forces soldier and Marine sniper. He's got a good number of patrols under his belt. He knows what he needs and what he can live without when he takes to the field. "I always take what I call my catch-all-gear," explained Amason, a 32-year-old from Elora, Tenn. "Those are the basics like your weapon, ammunition, optics, navigational equipment and flak jacket and helmet. With a water supply, that makes for at least 30 pounds on your upper body. If you're a (machine) gunner, then it could easily be 50 pounds you're carrying." "No matter where I go in the field, I always take my 'woobie,'" he added. "That's what my wife calls my poncho liner." "I'm the go-to-guy on a patrol, a regular walking 'Saigon Sam's,'" said Lance Cpl. Ryan P. Taylor, in reference to the military supply store just outside Camp Lejeune, N.C.
"You never know when you're going to need something, so I try to bring it with me," he added. This is especially true for Sgt. James M. Back, a platoon guide from Logan, Utah. Known as 'Snacks' to his platoon mates, the Marine always has a steady supply of food. "I blame it on my wife," he said "She really takes care of me with care packages, so everyone knows to come to me for junk food." "Marines learn from the experience of their squad leaders and then find out for themselves what works for them," Back said. "It really comes down to what you're willing to carry to be prepared for whatever you could get into."